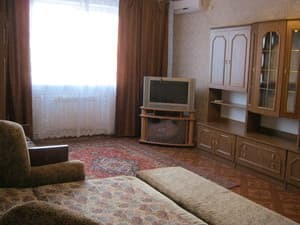 Private house "Na Korobkova" is located in Evpatoria in 15-20 minutes walk from the sea. The estate consists of six rooms, complete with all necessary furniture and household appliances. Each room has air conditioning, TV, refrigerator, bathroom, equipped kitchen. 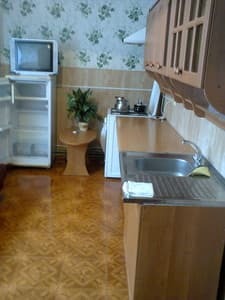 On the territory of a private house "Na Korobkova" - a large enclosed yard, BBQ, parking for three cars, a summer kitchen with a dining area. On request, a shuttle service is available at an additional cost. In two minutes walk from the house are shops, cafes, a market, a pharmacy. Distance to the bus station - 1 km, Simferopol - 60 km. PRICES MAY CHANGE, YOU NEED TO RECEIVE INFORMATION FROM THE OPERATOR! Description of the room: Cozy double room, equipped with everything necessary for a comfortable stay. Description of the room: The room is located on the first floor. The room has a double and single bed, wardrobe, table, chairs, kitchenette. Description of the room: The room is located on the second floor and has a separate entrance. Windows face the street. 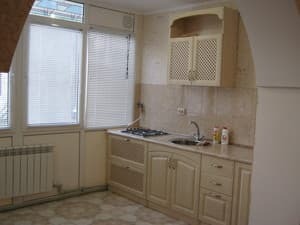 The room is equipped with all necessary furniture and appliances, as well as a kitchen that is equipped with everything necessary for cooking. Description of the room: Room with separate entrance, complete with all necessary appliances and comfortable furniture. 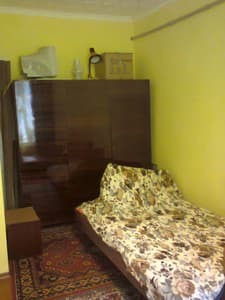 Description of the room: In the room there is a double bed and a single bed, all the necessary furniture, appliances. Description of the room: Spacious room for a family of 4-5 people, equipped with all necessary for comfortable living facilities. Check arrival: from 09:00 - 10:00 hours. Check leaving: to 12:00 - 13:00 hours. The private house is located 15-20 minutes walk from the sea. Distance to the bus station - 1 km, Simferopol - 60 km. From Simferopol by taxi, bus or train. It is possible to book a transfer for an additional payment.